The Blessings of an Ordinary Life: How Old Am I? There are some things that I know my family loves, but I just don’t ever buy them. Its not because I don’t want to make the people in my family happy, things just have to be “cost effective” for me to buy them (unless its something I want). An example of this is yummy, delicious pop-tarts. My kids & my husband love pop-tarts but I never buy them. Seriously, never. Now rewind to a few weeks ago. I was feeling very stupid brave & I decided to take the kids to Costco with me because I needed to restock our snack supply (the bottomless pits have been eating us out of house & home this summer). It actually wasn’t too bad (I mean people who have been tortured to give up top secret information have endured worse). We were navigating our way down the cereal isle & that’s when it happened. 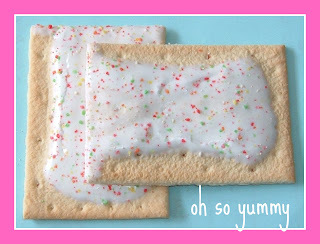 You guessed it…one of the kids spotted pop-tarts, the yummy, delicious treat that mom never, ever buys. Well, because I was feeling tired generous & because I would be buying in bulk (so they would be more “cost effective”) I told them we could get some. Now fast forward to today. The last of our pop-tarts have been eaten, they’re all gone, the last pack has been toasted and washed down with a cold glass of milk….and I’m sad about it. As it turns out I too love yummy delicious pop-tarts. I keep telling myself that it’s for the best that they're gone. They’re certainly not the healthiest breakfast I’ve ever offered my family. After all I’m a grown woman not a 5 year old. I don’t need pop-tarts, but unfortunately it looks like I am really going to miss them. I've never even looked to see how much they cost. Stacy Stacy Stacy. Let loose. Buy a few boxes next time. I ate some this morning for breakfast...with about 15 hershey kisses. Yummy. The End of the Hiatus is Finally Here!